Emphasis on reducing the number of touches needed in high pressure areas of the field in order to get the ball moving quickly and maintain possession. Description: Players form 2 lines. Both begin at the same time and jog from the first cone (A) to the second cone, lines then turn and run with high knees diagonally across the square so that both lines cross each other. Both lines then perform the same dynamic flex back to the starting position (A). The drill is run twice for each stretch. 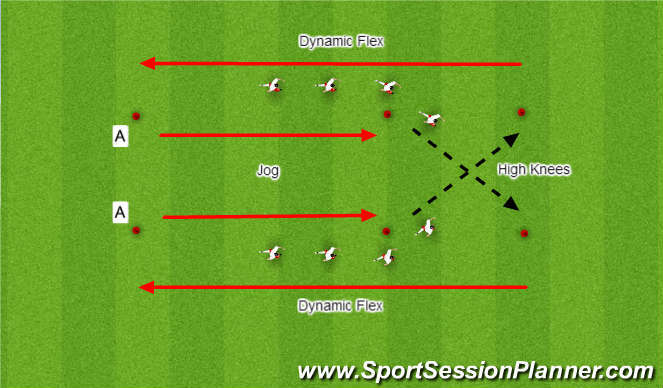 After stretching sequences are complete replace the jog, high knees, dynamic flex with variations of jog, sprint, and walk to elevate players&apos; heart rates and body temperatures. 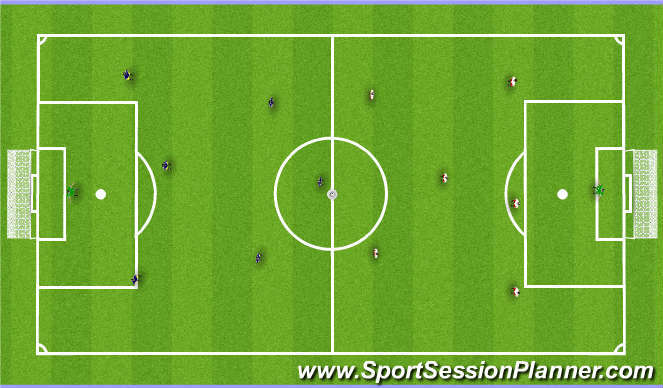 3 v 1 / 4 v 1: In a 15yd by 15yd square play 3 v 1 keep away (4 v 1 for groups that are not seeing enough success). Passing players score points by making 3 successful passes, defender scores by dribbling the ball out of the square. 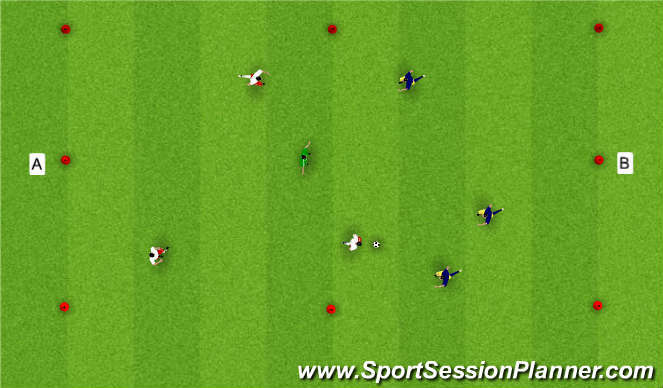 - Emphasise the importance of the players without the ball. They must make themselves available by checking out to provide the passing angle away from the defender, and slightly towards the ball to shorten and simplify the pass. -Never get caught standing watching the ball player. Don&apos;t wait for them to do something special to beat the defender, always give them the option to do something easy. 3 v 3 + 1: Two teams of three plus one neutral. The blue team tries to complete a pass into zone A to score, while the white team tries to complete a pass into zone B. The neutral is always on the team with the ball. This drill takes the principles from the previous drill and adds more defensive pressure since the team with the ball now only has a one player advantage over the defensive team rather than a 2 or 3 player advantage. - Off the ball movement now becomes even more important since most players will be defended. Do not automatically move towards the ball since now you are bringing a defender with you. - Check away from the ball to create space around the ball player, once that space is created, you or a teammate can check in to receive a pass. - Constantly recycle your movement off the ball, if you try to make yourself available and it doesn&apos;t work, check out and try again. -With more players in a tight space your movement may not be instantly obvious to the ball player, so when you make yourself available COMMUNICATE!! Tell the ball player where you are and that you&apos;re open. Conditioned Game: No GK. 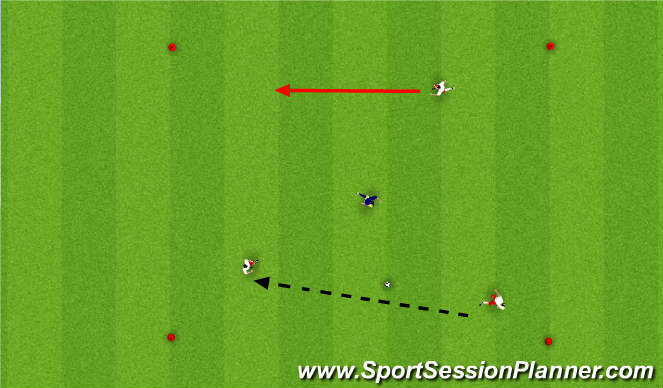 Between cone line A and cone line B the game is 3 touch maximum. In shaded areas the game is unrestricted. Players can&apos;t score from inside the 6yd box. Reinforce all previous coaching points by freezing the game at teachable moments. Emphasise that playing 3 touch will become much easier if the players without the ball are constantly making themselves available and communicating that to the ball player. Make sure to highlight positive moments when the players successfully do this. Scrimmage: 2 GK, regular rules, no restrictions. Tell the players that they should still try to incorporate the techniques covered previously even though there are no conditions on the game. Don&apos;t stop the scrimmage to teach, look for opportunities to coach individuals at appropriate coaching moments. Reinforce the key points of the night vocally without stopping the game.